Bernard Francis Casey was born in Wisconsin in 1870, the sixth of 16 children born to Irish immigrants. The crowd at Ford Field. AN IRISH-AMERICAN priest known for his steadfast devotion to the needy cleared a threshold on the way to possible sainthood on Saturday as the Roman Catholic Church beatified Solanus Casey, who is credited with the miraculous cure of a woman with a chronic skin disease. 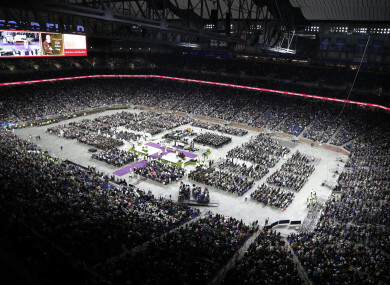 More than 60,000 people attended a Mass in Detroit where Father Solanus, as he was known, has an extraordinary following, decades after his death in 1957. Many insist their prayers to him have led to remarkable changes in their lives. Some of their stories were told on the scoreboard screens at Ford Field. Pope Francis said Father Solanus met the requirements to earn the rank of “blessed,” especially after Paula Medina Zarate of Panama was instantly cured while she prayed at his tomb in 2012. Father Solanus can be made a saint in the years ahead if a second miracle is attributed to him. He’s only the second US-born man to be beatified by the church, joining the Reverend Stanley Rother, a priest killed in Guatemala’s civil war, who was beatified in Oklahoma in September. One US-born woman has been beatified and two others have been declared saints. Father Solanus, a native of Oak Grove, Wisconsin, joined the Capuchin Franciscan religious order in Detroit in 1897 and was ordained a priest seven years later. But there were conditions: Because of academic struggles, he was prohibited from giving homilies at Mass and couldn’t hear confessions. He served for 20 years in New York City and nearby Yonkers before the Capuchins transferred him back to the St Bonaventure Monastery in Detroit in 1924. Wearing a traditional brown hooded robe and sandals, Father Solanus worked as a porter or doorkeeper for the next two decades, but his reputation for holiness far exceeded his modest title. The unemployed shared their anxieties with Father Solanus, the parents of wayward kids sought his advice, and the ill and addicted asked him to urge God to heal them. As he listened, he took notes that were later turned into typewritten volumes of his work. Later in life, when Father Solanus was stationed at a seminary in Huntington, Indiana, Detroiters boarded buses for a four-hour ride just to see the man with a wispy white beard. Mail piled up from across the country. In 1929, Father Solanus co-founded the Capuchin Soup Kitchen, which serves up to 2,000 meals a day in Detroit. The Capuchins built a center that bears his name and explains his life story. The public is invited to pray and leave handwritten pleas atop his tomb. Father Solanus’ name is invoked by many people who attend a weekly service for the sick. Shirley Wilson, 78, said she regularly prayed to Father Solanus to help her nephew get a kidney. He got one a few weeks ago. Vigneron hopes Father Solanus will inspire people to show mercy toward others. Email “60,000 attend mass in Detroit clearing the way for sainthood of Irish-American priest”. Feedback on “60,000 attend mass in Detroit clearing the way for sainthood of Irish-American priest”.